The Platinum Bottle Dye fountain pen ink comes with a built in reservoir to making filling your fountain pen easy. The ink comes in several colors from black to red. 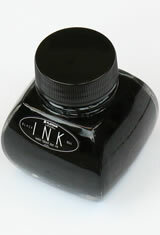 The Platinum Bottle Dye (60ml) Fountain Pen Ink usually ships within 1 business day unless otherwise specified. Each Platinum Bottle Dye (60ml) Fountain Pen Ink we sell is guaranteed to be genuine, authentic and will arrive brand new & unused!